The world knows that things are very uncertain in America. That there are those in government presenting undue obstacles for the President and undue stress on those of us who live in this country. Each day the news flashed on the screen of my computer show the play by play as if it was some championship ball game. A game it is, it seems. The nightly news attempts to offer insight and somewhere a thread of hope while at the same time presenting the “what-may-comes” if the situation is not rectified. To say it is bothersome is being low key about the issue. It is constantly on my mind. On anyone’s mind who will admit it. I have experienced the financial losses the actions of the government can bring to the financial market. In 2008 my world cratered with the stock market. I was busy trying to help my sister determine if her house had made it through a major storm and whether or not she had a home to return. It wasn’t exactly in the forefront of my mind that the capers of a President and his administration at the time would bring the market to its knees. It wasn’t really something I should have had in the forefront of my mind. It should never have happen. Three years of difficulties followed. Some of the worse times I have ever experienced. I held on. I maneuvered the rocks in the path. I held on to hope trying to find it in the small things. Held onto confidence in myself, in my shear ability to survive. Now once again the same group is pulling the country down and for what purpose, merely to prove a point. To degrade the efforts of one man because of his colour. It is deplorable, really and unacceptable yet it is happening because they have the power to do so. Yesterday on the news it was announced that social security checks may not be issued as early as next week. There are many of us who after paying into that for our careers depend on it as a source of monthly income. So to have that not show up in our accounts could mean we can not eat. We can not pay our bills. We can not basically live. Yet do those who are causing this upheaval care, it doesn’t seem that way. After all, all of them are wealthy and do not know what it would be like to not have money for food. Or money to keep the utilities going. Somewhere once again after we overcome the quick anger at the silliness, we have to find hope. A sign of hope here. One there. 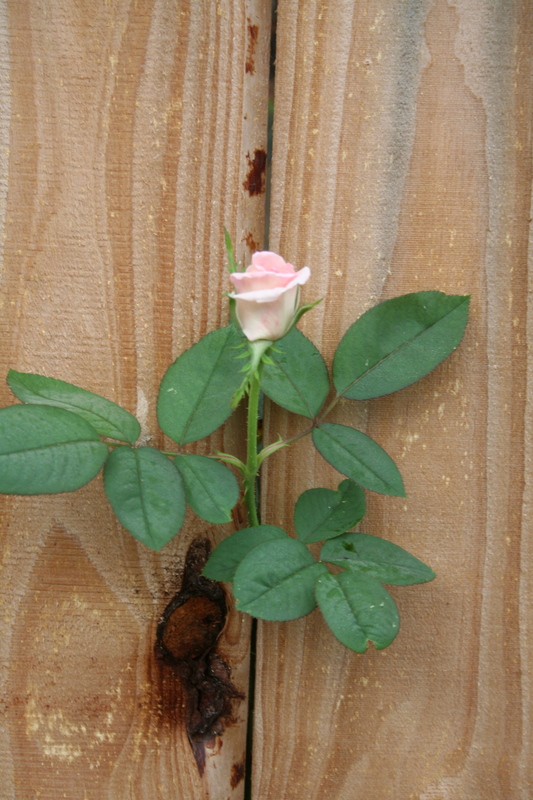 This morning peeking through the fence bordering my property with the neighbors is a beautiful rose bud. It has struggle through the small space between the two boards to show its beautiful face. Determine to smile at the sun on this side. Determine to bloom into a beautiful blossom. It is a sign of hope. Hope that must be held in the heart to overcome what is out of our control. To once again maneuver through the confines and find our glow regardless of what those cavalier politicians attempt to do to our world. 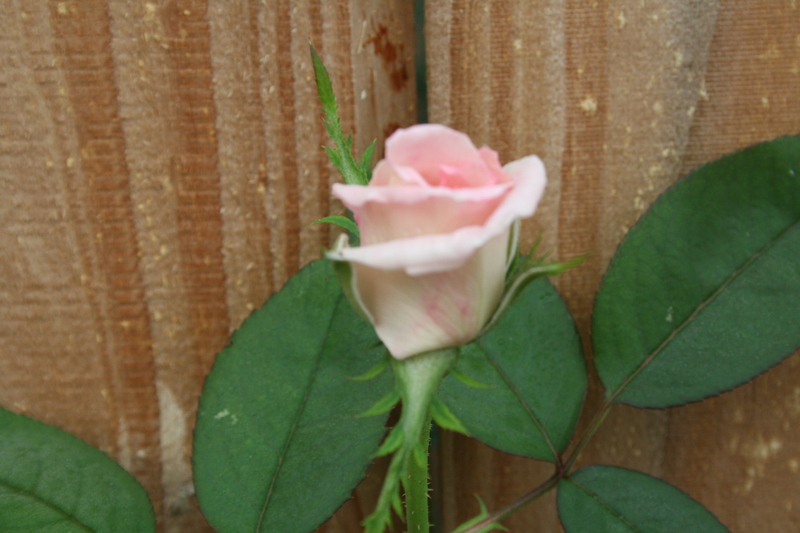 So this morning I am grateful for the rose peeking its face through the fence offering hope in very uncertain times. Taking in its beauty, delicate although strong. It is a message that there is hope and to keep the faith in our strength. To continue on our path pushing aside the rocks that appear and to keep hope in our hearts that the issues at hand will be resolved. A smoother path found. And so it is the rose, a way of finding hope in uncertain times. This entry was posted in Uncategorized and tagged confidence, Difficulties, faith, hope. Bookmark the permalink.